I’ve entered my last transaction into Quicken 2007 for Mac. I’m tired of the interface, it’s the last PowerPC application I have on my Macintosh (I want to uninstall Rosetta), and it’s clear to me that while no alternative solution is perfect, I have to move forward. The two leading candidates for me to move to are Quicken Essentials 2010 for Mac and iBank. This will be my review of iBank. Both products will be reviewed from the perspective of a Quicken 2007 for Mac user, so bear that in mind as you read them. 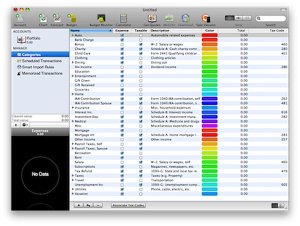 The Quicken Essentials 2010 for Mac review will be published after the February 25th launch of Quicken Essentials, at Intuit’s request. Writing software reviews is hard work. It’s terribly time consuming and once you’re finished you have inevitably missed discussing things that are important to many people and covered in detail things that few people care about. At least that’s how it feels. To that end, I’m very happy to answer questions, either publicly in the comments, or directly via the Contact Me form on my site. I’ll endeavor to provide a broad review of both products, be fair and objective in my delivery but, ultimately, I’m going to pick one and use it and that will be the product I stand behind personally. You can download iBank from the IGG Software website. 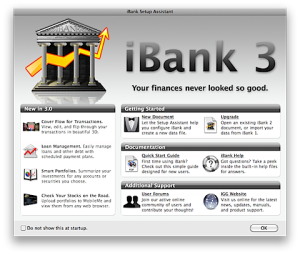 iBank installs like any other Macintosh program. I always like developers who provide a link to your Applications folder, so that after mounting the disk image you don’t have to go searching for it to drag and drop the Application there. iBank doesn’t, but it isn’t that big of a deal. Included on the disk image is the application, iBank itself, a sample data file, a Read Me, and a shortcut to download the iBank widgets for Macintosh. The link to the widgets will download a second disk image that includes the iBank Transactions widget and the iBank Budgets widget. After dragging and dropping the application into your Applications folder, fire it up! Fortunately for those of you trying it out, iBank provides a full featured demo. You can setup as many accounts, play with all of the features, and check out every part of the application as thoroughly as you’d like. The demo will continue to operate until you’ve entered 75 transactions into iBank. Unfortunately, if you’re importing data from another Personal Finance application, you’ll most likely expire the demo immediately, I know I did. Thank goodness the folks at IGG Software helped me out so I could finish my review. Thanks guys! So, make sure you try out the application before doing any data imports, or else use an account from your source application that only has a few transactions so you can get a feel for the data import process. We’ll go over many of these features throughout the review. The Setup screen will let you create a New datafile, Upgrade an existing data file, read the Quick Start Guide, get iBank Help, access the iBank User Forums, and access the IGG Website. Check the box in the lower left of the screen if you don’t want this to pop-up every time. Toolbar: The toolbar should be quite familiar to you if you’ve used any Macintosh applications before. From here you’ll add Accounts, Charts, Forecasts, and Budgets. You can also pull up your Budget Monitor, access the OSX Calculator, Get Quotes for your Portfolio, access your Account’s website, Download transactions, and Sync Devices. Source list: Here you’ll find all of your accounts, portfolios, charts, forecasts, categories, and assorted other information. Mini-graph: A very nice feature in iBank is that you can setup a mini-graph that is always being displayed. Transaction view: (Okay, yellow was a bad choice) The Transaction View should be familiar to you from Quicken. 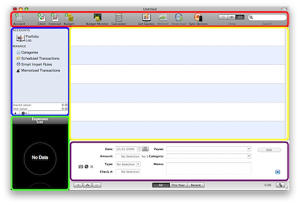 However, in iBank there are three views available and the default is called Thumbnail. The Thumbnail view shows a small picture for each of the transactions based on its category. This view also provides the advantage of providing more details about the transaction on one line. If you want a more traditional Quicken-like view, then head to the View menu and select List (or you can use the View control on the Toolbar). Transaction editor: This is just what it sounds like. You will be creating new transactions here (start by pressing the + button), or editing existing ones. If you’re new to Personal Finance software, or you’ve decided to make a clean break when moving to iBank, then just skip this section. However, if you’ve been following my articles about Quicken Essentials, then this is where the Application is going to shine, or not. iBank shines here. iBank supports importing of data in QIF (Quicken Interchange Format), OFX (Open Financial Exchange, sometimes referred to as QFX as well), and CSV (Comma-Separated Value) formats. Additionally, you can connect iBank to your financial institution and download transactions directly. If your financial institution isn’t directly supported, then you may still be able to use the built-in web browser to pull down a supported data file and then import it. My Quicken Data file is 13MB in size, contains 75 accounts (only 15 are active, but keep reading), and is made up of over 20,000 transactions. I’ve been using Quicken for a LONG time. To prepare for this transition I initially thought I’d have to leave things behind. However, I found this video done by IGG Software on importing your Quicken data. It’s well worth the 2 minutes it takes to view it. Here’s the main issue with exporting and re-importing all of your transactions. It’s very complex. If you’re anything like me, then you have Checking accounts which make payments to Credit Cards, Loans, Portfolios, Brokerages, 401-K accounts, IRAs, and other investments. Some of those transactions even utilize splits, in which case a single transaction in your Checking account may touch several other accounts. Now, if there is any issue in importing an account, or worse if the account isn’t supported (hint, hint, Intuit), then a ripple effect starts happening. Those transactions may not get imported. They may get imported, but with parts of them missing categorization. The worst case is that they either fail to import entirely, or they import with a different amount. That tosses your entire account out of balance. iBank imported my Quicken Data file, using the instructions in the video, in about 10 minutes. Patience is the word here, if you have a large data file, it’s going to take a while to complete the import. Be patient. If you think the application has crashed, it hasn’t, be patient. If the application beach balls, be patient. I’m not sure whether or not it was a good export because Quicken 2007 for Mac gave me a mysterious error when the progress bar was only about 20% completed. Additionally, the QIF file that was created by Quicken was only 2.3MB in size, when the original data file was 13MB. However, iBank imported 73 of my 75 accounts. The missing two accounts were a Credit Card account and a Brokerage account. I then spent some time going through each account and verifying the balances. I did this by opening up the Account Manager and checking off accounts to be hidden, if their balance matched what I had in Quicken. Unfortunately, it took 8 seconds for the check to appear on each account. After verifying the balances for each of the 73 accounts, I found 11 accounts that had incorrect balances following the import. I decided I wanted to figure out why the two accounts didn’t import. So, I opened them up under Quicken. Imagine my surprise when I found out that iBank was now batting 1000 (that’s 100%) on account imports! The two accounts were both empty. Zero transactions. So, since there were no transactions, either Quicken had failed to export them, or iBank had skipped importing them. Hard to tell which, but it didn’t matter. Now that the account issues were solved, it was time to dig into the 11 accounts that had balances that weren’t correct. I selected one of my Checking accounts that was off by $20. Start simple I always say. Unfortunately, this account had 3 years of transactional history. I checked the balance on the first day, it was right. I then skipped forward a year and checked on the 1st of the year. It was right too. Eventually I figured out which year the issue was in, I then repeated those steps by month until I found the month the issue occurred. Here’s where the interesting stuff happens. On 8/20/1998, I had two ATM Withdrawals for $20.00. Those withdrawals had associated ATM Fees of $1.00. I put them both in as splits with $20.00 into my Wallet account, and $1.00 into Bank Charge (my category for all the money the bank charges me for having my money with them). However, in iBank there were 3 transactions. The two $21.00 withdrawals from my Checking account AND a single $20.00 withdrawal as well, without an associated $1.00 Bank Charge. It wasn’t a split transaction. This is what I mean by complex. Little tiny things can throw accounts out of balance. In this case, the account was fixed. I just deleted the extra transaction. 10 more bad accounts to go. Now, I have to tell you, most users won’t have these issues. Also, it’s impossible to tell where the issue was, in Quicken’s export? Or in iBank’s import? Whew! That was a long section, but I think it’s important, because if you’re moving a decade worth of transactions, you want to know if you’ll be successful. Conclusion: iBank did a fantastic job moving my accounts around. It also pulled in all of my custom categories and layered them on top of its default categories. Adding transactions to your accounts is how you’ll interface with iBank most often. In Quicken, this is an extremely straightforward process: there is always an “empty” transaction at the bottom of each Register, you fill it out, hit return. iBank isn’t as straightforward, but it isn’t bad. Transactions you enter are automatically “memorized” so that you do less typing the next time you enter the transaction, having to enter only a few characters, then the amount, and Return will save it. Another great aspect of iBank is the Mini-graph. It will automatically start updating based on the transactions you’re entering, showing you how your spending is broken down amongst your categories. Unfortunately, it only updated based on transactions I entered after completing my import and didn’t include transactions from the import itself. Over time this won’t be an issue. Additionally, I found that you can hide the Transaction Editor from the View menu and just Toggle Transaction Editor. It gets rid of a control on the screen you’re only going to need when editing or changing a transaction. An added benefit of doing this for Quicken users is that you’ll end up with something very similar to your old Quicken method of transaction entry, but you still have to hit the + button to start a new transaction. I have to admit, at first I thought this was just eye candy. You open an account register and see all of your transactions are color coded by the category they’ve been assigned. When you’re using the Thumbnail view, it’s not bad. When you use the List view, it can get very overwhelming. However, after a while, and many, many adjustments of the colors, I found I started to like this aspect of iBank. I changed my Salary categories to be dark green, that’s money into my account. I then worked on making my budget busters (Dining, Auto, Travel) into colors that stood out in the Transaction view so I can quickly see how often we’re putting money into those areas. Unfortunately, if most of your categories were not already present in iBank, then you’ll have to manually assign them appropriate colors, as all imported categories have no color by default. At the time of writing this article, iBank supported over 450 different online financial institutions. For my active accounts all but my local credit union was supported, while National City Bank, E*Trade, PNC Bank, Fifth Third Bank, American Express, Citibank, Discover, and Merrill Lynch were all supported. However, 450 institutions isn’t many, so if online access is important to you, check out their list of supported institutions first. I setup a couple of accounts to be downloaded and it worked as expected. This is a feature that isn’t unique to iBank, but is certainly unique when comparing it to Quicken. I used to use PocketQuicken on the Palm PDA and Windows Mobile platforms. I loved it and one of the features I lost when moving to the iPhone was being able to check balances and, most importantly, create transactions. iBank allows you to synch your accounts, transactions, and balances in three ways: via Bonjour over WiFi, MobileMe, and with a WebDAV Server. I chose to sync my iBank via MobileMe, since I didn’t want to have to rely on having WiFi access. 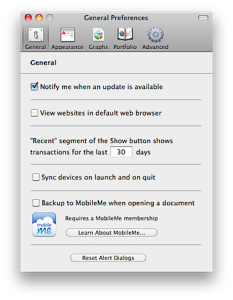 MobileMe is just a WebDAV server, so if you don’t subscribe, you may be able to setup your own WebDAV server to do the synchronization, or else just stick with Bonjour. While this isn’t a review of the iBank for iPhone app (iTunes Link). I loved what I saw and spent about 20 minutes playing with it, adding transactions, synching them back into my iBank Desktop, and doing some local charting. It’s a great addition to a great product and provides something that the other Personal Finance applications are lacking. I wish I had more time to play with this feature. This is iBank’s answer to tagging. What you can do is create special accounts that are built off of various criteria from your transactions. These Smart Accounts can be dynamically created from data according to account, payee, memo, amount and/or category. If you’ve ever played with Smart Playlists in iTunes, you’ll know immediately how these work. The easiest example I can come up with is to create a Smart Account called “Expense Report”, tying it to your Memo field and looking for special categories (like Travel:Business) and special keywords in your memo field (like “Expense Report”). Then you can just bring up that account and immediately see all transactions you should submit for reimbursement. It can be quite powerful as you start using it. iSight Integration: You can take pictures and attach them to your transactions, as additional reference for your purchases. Nice for insurance too! iCal Integration: Setup your scheduled transactions to appear in iCal as a reminder you can carry around (or have emailed to you). Smart Import Rules: Hate how your Financial Institution puts all kinds of garbage in your downloaded transactions? These will let you clean them up. Investment Tracking: Smart Portfolios, Online Portfolios at MobileMe, Expert Trading like short and long puts and calls, options, and others. Investment Tracking: No buys and sells, no advanced investment performance reports. Additionally, Check Writing has also gone the way of the Dodo Bird in Quicken Essentials. Well, I’m happy to report that some of these issues are resolved by going to iBank. You can definitely do Check Writing and export data to TurboTax. So that’s 50% better. iBank also supports Brokerage accounts and stock performance graphing, which Quicken Essentials does not. That’s 75% better. Unfortunately, iBank doesn’t provide Online Bill Pay, but neither does Quicken Essentials, so that’s not a deal breaker. The most annoying aspect of iBank is that it’s slow. It’s not so slow that the application is unusable, far from it. However, iBank is annoyingly sluggish. I first noted this behavior after I completed importing my transactions and was using the Account Manager to hide inactive accounts. It literally took 8 seconds for the checkmark to appear after I clicked in the check box. I then noted sluggishness when switching accounts, it took 4 seconds for the Transaction view to update with the transactions for the new account. I played around with the settings a bit, and noticed that below the Transaction editor you’ll find buttons for setting what transactions are being shown: All, This Year, or Recent. Setting the Transaction view to only showing Recent transactions solved the delay in switching accounts (this is a global setting). Setting it to This Year was also sufficient. iBank is a winner. If the feature set matches up with your needs, then you can’t really go wrong moving forward with a purchase of iBank and using the application as a solid replacement for Quicken 2007 for Mac. Does it have every feature? No. Does it have more than the latest release from Intuit? Yes. That’s enough to give it a solid recommendation in my book. The speed issues can be worked around and I believe the benefits overcome this deficiency. It may even be possible that with some additional tweaking on my part, I can resolve the speed issues I’m seeing, much like I did on the Transaction View. Mac360 did an article on the Top 10 Money Managers to Replace Quicken: No surprise, iBank is Number 1. After writing this article, IGG Software released iBank 3.5.5. To be honest, it may have been out before I wrote my article (which was done completely on version 3.5.4), which brings me to my point. After launching iBank, immediately go to the Preferences menu and check the box for Notify me when an update is available. I’m not sure why this option is off by default, but it is. You need to manually enable it, or else you won’t know there is a new version available. One of the fixes? Better importing of split transactions! I’m going to re-import my original Quicken Data Export file and see if my results improve over the already acceptable import process iBank did previously. At the request of several readers, and to answer the question regarding Class support in iBank, I added several Classes to an account in Quicken 2007 and imported it into iBank. The results are good and bad. The Bad: Because Quicken really didn’t support Tags, Classes were just appended to the Category following a “/” character. While Quicken knew those were Classes and could do “things” with them, no one else knows what they are and they just import them. iBank is no different. It imported my transactions that had Classes as a new Category. So, I had “Auto:Fuel/Business Expense” in Quicken, but in iBank I ended up with two categories under Auto: Fuel, and Fuel/Business Expense. The Good: iBank didn’t totally ignore them. So, you still have your data intact and can report on it after you’ve imported your data into iBank. It may then be possible to run some updates on the Transactions and move the “Business Expense” into the Memo field. If you can do that, and that’s a big “if” at this point and beyond the scope of this article, then you can change the category “Auto:Fuel/Business Expense” to just “Auto:Fuel”. You’d then have properly “tagged” transactions that you could build a Smart Account off of and be back to where you were in Quicken. It’s far from perfect and it relies on figuring out how to perform a mass update on all of your transactions to perform the above translation, but it may be possible.